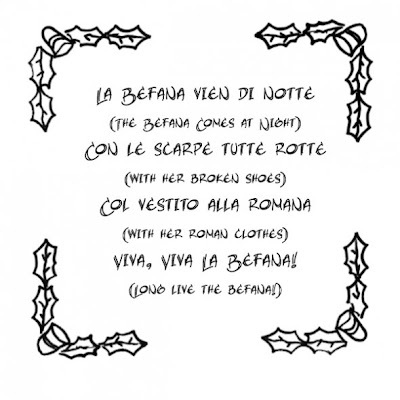 When I was little, I kinda got two Christmases...my family celebrated both Christmas AND La Befana, an Italian celebration of the Epiphany on January 6th. Dang, I sure was a lucky kid! La Befana is a traditional Italian legend of a little old witch who delivers small presents to children on Epiphany Eve (January 5th). She looks like a unkempt old lady, with straggly hair, patched-up skirt, raggedy shawl and broom. While she looks like an old witch, she is actually kind and only punishes bad boys and girls by leaving coal in their stockings. For kids who have been good, she fills up their stockings with candy, fruit, nuts and small gifts. 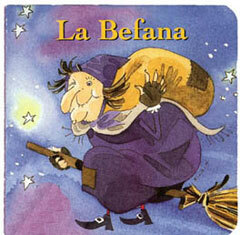 The legend of La Befana is one of Italy's oldest and most celebrated. One popular version of the story is below. There once was an old woman named la Befana. She was renowned as the best housekeeper in the village. One day, she is visited by the Three Wise Men (the Magi) who are on a journey to find the Son of God. They ask her if she knows the way, but she does not. Being a kind woman, she invites the Magi to stay in her home for the night. Grateful for her kindness, they ask la Befana to accompany them on their journey, but she refuses, saying that she has too much work to do. After her guests leave, she has a change of heart, packs a number of gifts and sweets for baby Jesus, and heads out to follow the Magi. Sadly, she never finds the Magi nor the baby Jesus. To this day, she continues to search for the Son of God, leaving gifts for children in her path. She does this because she knows Jesus lives in the hearts of all children. When I was little we always kept our stockings up until La Befana passed by our house on January 5th. My sister and I would receive small presents and candy (as long as we had been good!). Our family still celebrates La Befana, especially when I can't make it home for Christmas as an extra little celebration. It has always held a special place in my heart as well as my cultural history. And how cool is it to have a Christmas witch?! For the next La Befana celebration, make sure to keep those stockings hung by the chimney in hopes that La Befana will soon be there! I'm also Italian. We played Tombola and ate roasted chestnuts a lot. I am Italian as well. My kitchen witch doll plays double duty as La B. too, though we never celebrated as a child. I also have started to slowly incorporate other traditions too, like candles in the window in blue candle holders as a nod to Saturnalia. It's nice to bring some of the old world home in new ways.